It all started during the height of the depression, when Professor Dr. G. Frederick Smith, his brothers Allyne H. Smith and Clarence Smith, the founders brought aerosol whipped cream to market for the first time. Dr. Smith and his brother Allyne devised a system to take dairy cream, process, package and pressurize it in returnable containers to produce Instantwhip whipped cream for use in restaurants, ice cream shops and soda fountains nationwide. 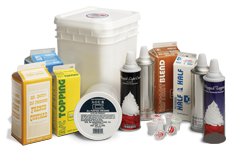 The Smith’s returnable container and filling system made a process invented and patented by Professor Dr. Charles A Goetz for whipping cream under pressure both economical and commercially viable. Since 1933 distributors of Instantwhip Foods have grown to become international manufacturers and distributors of fine dairy and non-dairy refrigerated food products to the foodservice and bakery industry. Instantwhip Foods distributors provide products under many popular brands such as Instantwhip Cream, Instantwhip Topping, B/C Topping, Instantblend Coffee Creamer, Baker’s Finishing Touch, YAMI Yogurt, Ambrosia® Gourmet Frozen Yogurt and many others. International Distribution… Neighborhood Service, that’s Instantwhip Foods!